In a battle that went down to the wire, Lokomotiv Kuban Krasnodar improved to 2-2 in Top 16 Group F by rallying to edge Zalgiris Kaunas 80-75 at home on Friday. Lokomotiv moved into a tie with FC Bayern Munich for fourth place in Group F, while Zalgiris dropped to 0-4. 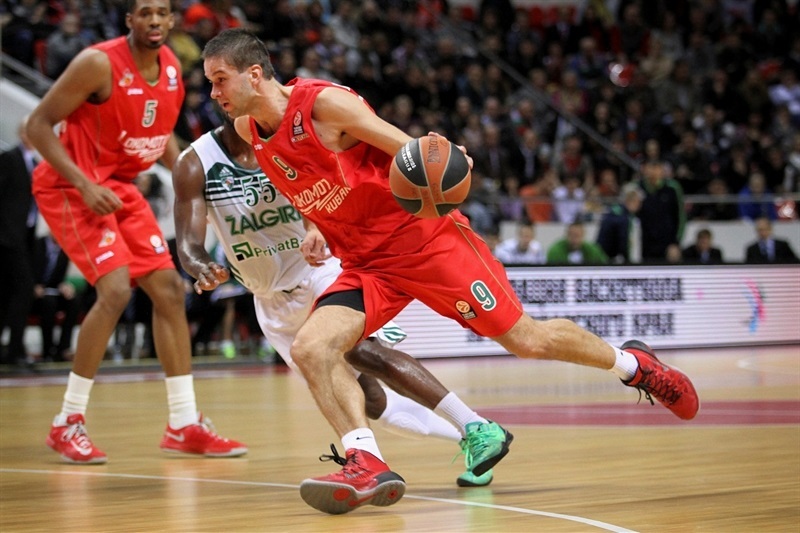 Krunoslav Simon paced the winners with 21 points, 6 rebounds and 8 assists. 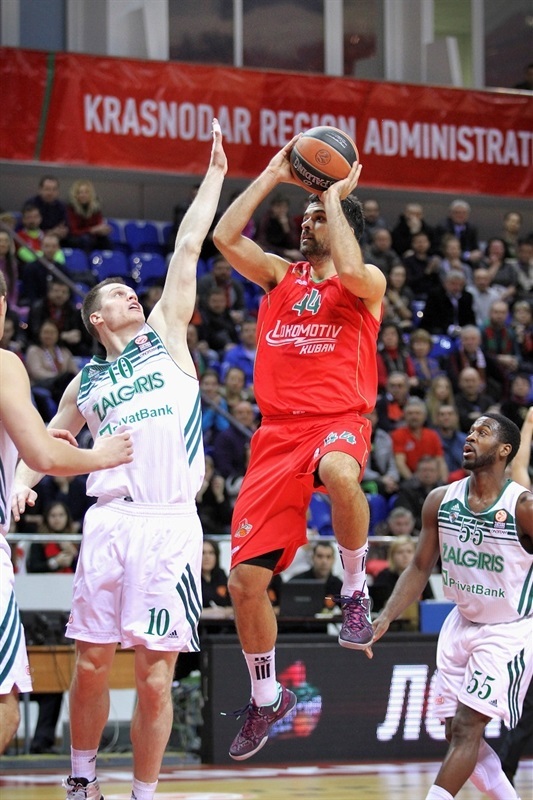 Valery Likhodey and Simas Jasaitis each added 11 points while Aleks Maric had 10 for Lokomotiv. Robertas Javtokas led Zalgiris with 16 points. Justin Dentmon added 15 while Vytenis Lipkevicius had 10 for the guests. 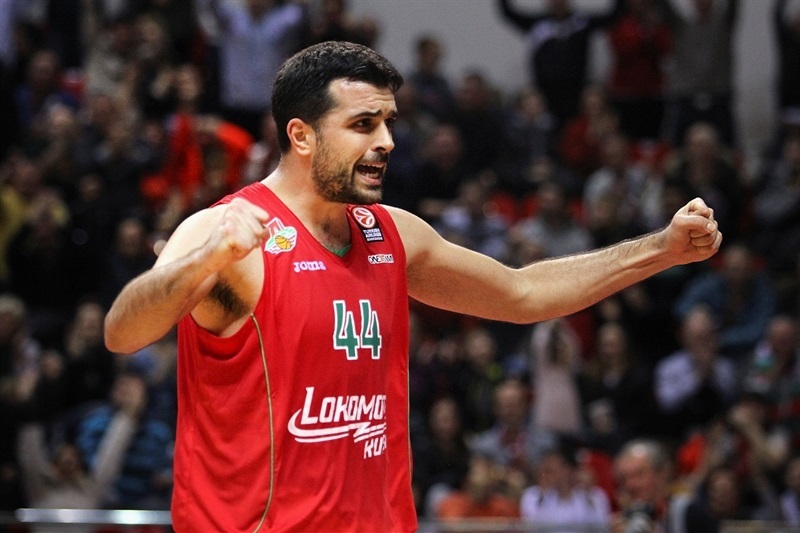 Dentmon added 11 assists to break Zalgiris's Euroleague club record, which previously belonged to Ed Cota (10). Dentmon had 11 first-quarter points and got help from Ksistof Lavrinovic and Lipkevicius to give Zalgiris a 16-29 margin after 10 minutes. Zalgiris found a new go-to guy in Javtokas, as the guests reached halftime with a 39-51 lead. Lokomotiv improved its defense after the break and Kalnietis brought the hosts a bit closer. Zalgiris still led 67-75 with four minutes left but Bykov and Likhodey fueled a final 13-0 run that allowed Lokomotiv to win the game down the stretch. Sergey Bykov got the hosts going with a four-meter jumper. Paulius Jankunas did better with a three-point play that gave Zalgiris its first lead, 2-3. Mantas Kalnietis fed Simon for a layup, but Dentmon answered from downtown. 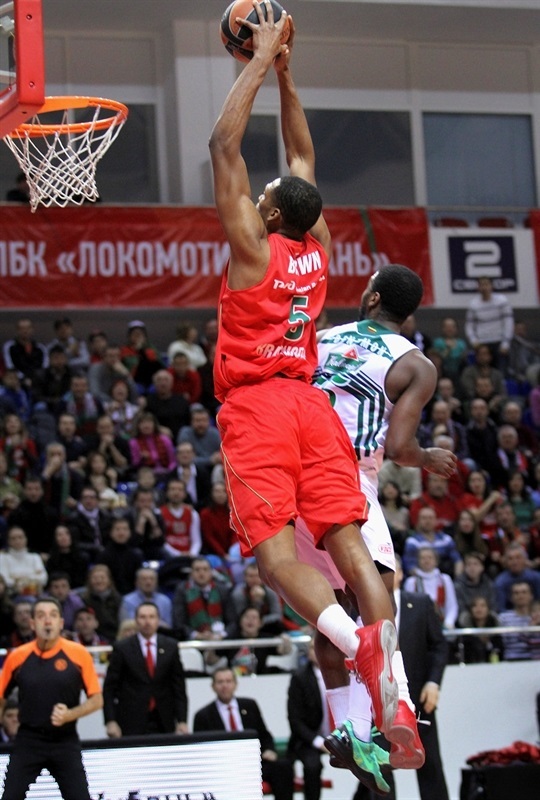 Simon hit one from beyond the arc and Derrick Brown followed with a two-handed slam to give Lokomotiv a 9-6 edge. Lipkevicius and Dentmon took over with back-to-back three-pointers. Bykov kept pacing the hosts with an acrobatic layup that Dentmon bettered with his third triple. Arturas Milaknis shined with a floating layup that made it a 6-point game. Maric made free throws that Martynas Pocius erased with a jumper. 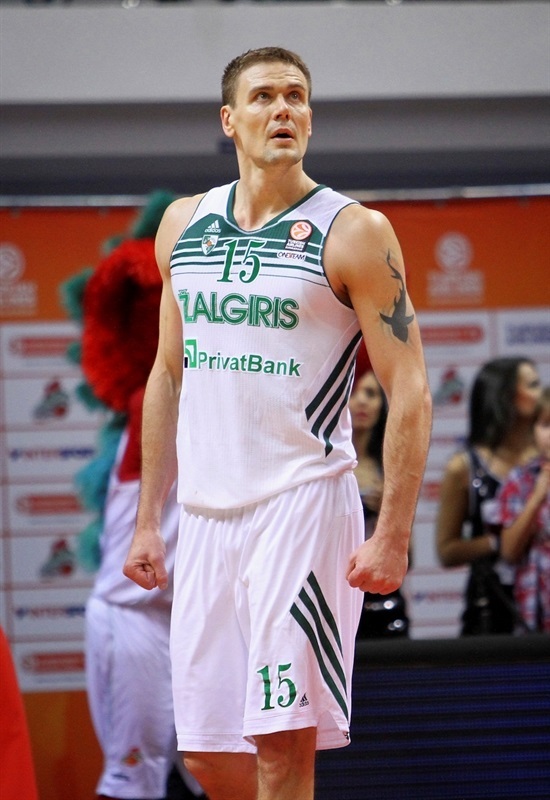 Simas Jasaitis sank foul shots and a layup-plus-foul by Lavrinovic made all Lokomotiv fans start to wonder at 15-22. Mindaugas Kupsas banked in a jump hook before Maxim Grigoryev split free throws. A jumper by Dentmon gave Zalgiris a 16-29 lead after 10 minutes. Simon buried a bomb from downtown early in the second quarter. Kupsas hit another jump hook that Brown erased with his trademark mid-range jumper to make it 21-31. Javtokas scored around the basket and a layup by Lipkevicius kept Zalgiris way ahead. Javtokas capped a 0-6 run with a big basket in the low post. Simon tried to change things with a driving layup. Lokomotiv improved its defense, while a red-hot Simon struck from downtown and Andrey Zubkov added a fast break layup, which caused Zalgiris to call timeout at 28-37. Javtokas kept pacing the guests with another layup that Jasaitis improved on with a three-pointer. 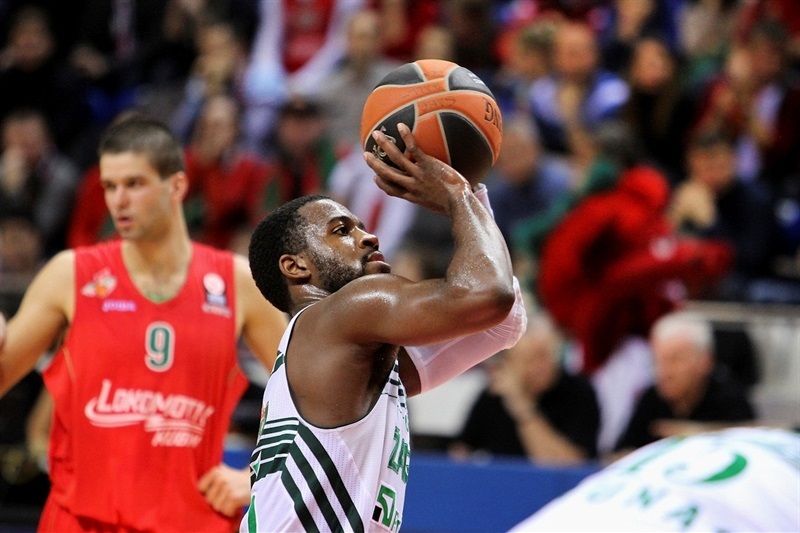 Dentmon made free throws and so did Javtokas for a 31-43 Zalgiris edge. An unstoppable Simon shined with a three-point play, but Lipkevicius erased it with another corner triple. Dentmon hit more foul shots before Valery Likhodey struck from downtown and a layup by Maric brought Lokomotiv within single digits, 39-48. A three-pointer by Tomas Dimsa boosted Zalgiris's lead to 39-51 at halftime. Both teams struggled to score for more than two minutes until Javtokas stepped up with a reverse layup, good for a 39-53 Zalgiris lead. Likhodey answered from downtown, but Lokomotiv kept struggling to keep Brown and Maric involved. Javtokas scored around the basket. Maric found space for an uncontested layup, but a two-handed dunk by Kupsas gave Zalgiris a 44-57 edge. 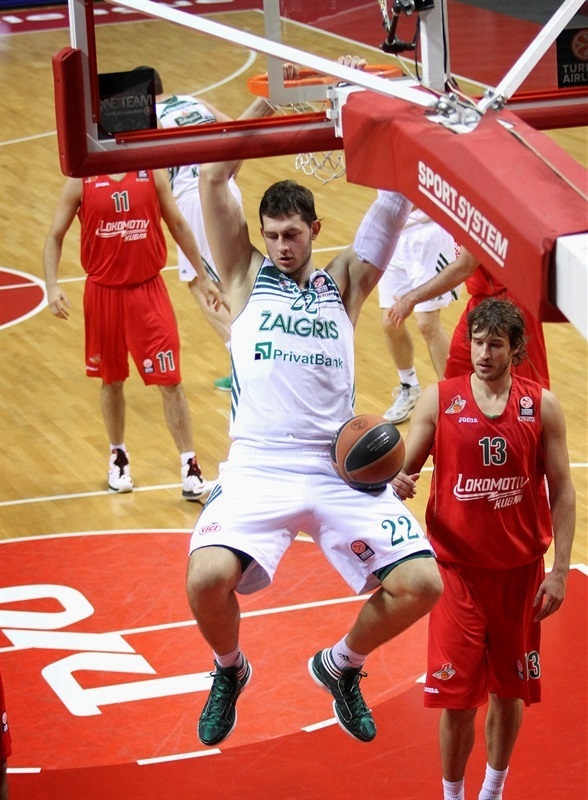 Jasaitis nailed a jumper and Kalnietis dunked it off a steal to bring his team within 48-57. Lipkevicius hit a six-meter jumper that Maric erased with a layup. Jankunas finished a three-chance Zalgitis offense with a jumper, as Lokomotiv looked for answers on offense. Simon tried to change things with a close basket and free throws by Alexey Zhukanenko made it a 7-point game. Javtokas silenced the crowd with an alley-oop layup and followed that with his trademark, old-school hook shot, but Kalnietis singlehandedly kept Lokomotiv within 58-65. Jasaitis buried a mid-range jumper early in the fourth quarter, as Zalgiris tried a more experienced lineup with Dentmon and Pocius as the guards. Jankunas stepped up with a three-pointer that gave the guests fresh air at 60-68. Kalnietis answered from downtown, but a corner triple by Vytenis Cizauskas restored a 63-71 Zalgiris edge with over six minutes left. Jasaitis swished a catch-and-shoot jumper, which a red-hot Cizauskas matched with a driving layup. Maric took over with a backdoor layup, but he didn't find much help around. 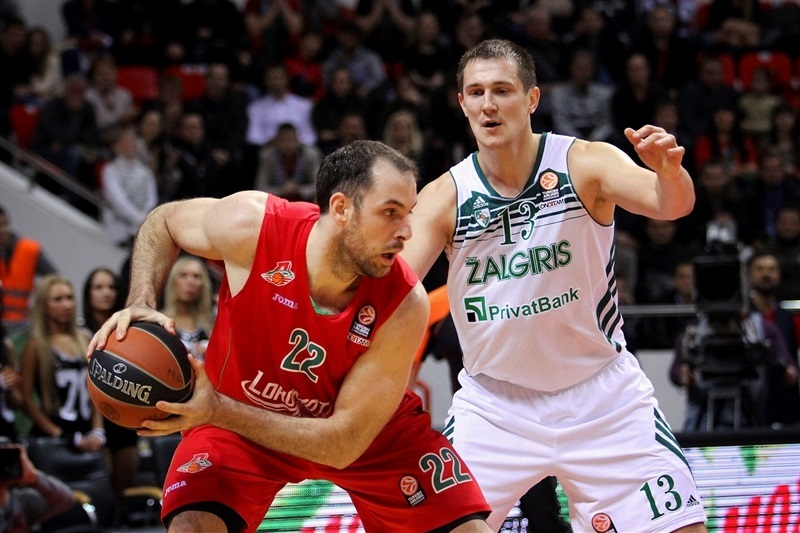 Meanwhile, Lavrinovic scored down low for a 67-75 Zalgiris lead. Bykov made free throws and a three-pointer by Simon ignited the crowd at 72-75. Bykov took over with a layup off a steal – and the free throw that came with it, tying it at 75-75 with two minutes left. 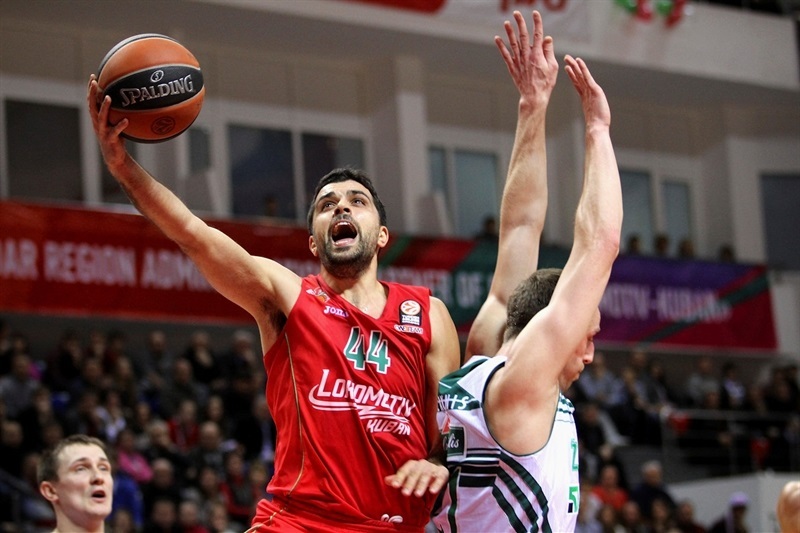 Likhodey completed the hosts' comeback with a three-pointer, 78-75. Zalgiris could not find the way to the basket for four minutes, and committed 2 turnovers in the final 20 seconds. Free throws by Likhodey capped a final 13-0 run and allowed the Lokomotiv fans to celebrate a big win. "We deserved this win for playing with all our heart today. Our team in the second half is the team we want to be. In the first half there were mistakes on defense to work on, but most importantly we've shown our character on our home court. Everyone who played was coming out to fight. That's another close win for us, but this is the Top 16 we dreamed about; it's hard but we are a passionate team and will do our best to reach the playoffs. " "Justin Dentmon suffered a little injury and in the second half wasn't able to play on his level, we missed his offensive game. It was a good game, but we missed a great chance to get our first Top 16 win. But, still I believe that my team can reach the playoffs. We have 10 games ahead and it's plenty of time to correct our mistakes and get consistent in close games. "